Discussion in 'Videocards - NVIDIA GeForce Drivers Section' started by Keno34, Jan 15, 2019. Taskbar > Right Click > Nvidia Control Panel > Global Settings > Monitor Technology > Gsync Compatible -- Hit Apply. Monitor should disconnect and reconnect as if you were doing a driver update. If your monitor is over 60hz (it likely is) you will have to go into Change Resolution > Select your monitor -- change it back to 144hz.  [Windows 7][G-SYNC]: Game FPS drops when G-SYNC is used with V-Sync.  [Shadow of the Tomb Raider]: Fixed occasional application crash in DirectX 12 mode. d0X and Warkratos like this. 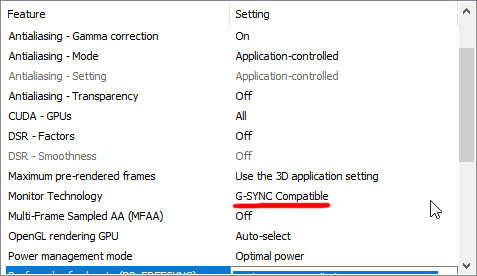 Just installed these and it enabled "G-SYNC, G-SYNC Compatible" mode by itself. My monitor is an Acer XG270HU. have any benefict use it on 60hz monitor? maybe to reduce input lag or eliminate screen tearing? Would like to know this as well. Any reason to install these for those of us on regular screens? I'm not even using a monitor, haven't for years. Using a 43 inch 4k 60hz tv as my monitor.